Bold and colorful! I like my overall style to speak for itself. I am rarely black or white because I'm everything in between. My artsy style started young with my mom's flare for dressing and accessories, which taught me to push the limit without being gaudy. She has always encouraged me to just be me. I find this freedom of expression comes alive in my beadwork. The beads inspire me. It's like they speak through brilliant colors, unique shapes and imperfections to tell a story. Music is also a great inspiration for me as it can set my mood and send me to a creative zone. I love all music venues, but I'm a rock 'n roller at heart. What inspires an idea is not really definitive because everything and nothing can inspire me. Ideas just pop and I go with it. Mostly my ideas come from my dreams or when I meditate. So, there are infinite possibilities to draw from, I guess it's whatever speaks the loudest. Seed beads, gemstones, crystals. It's so satisfying to mix different sizes to create a wearable work of art. The unlimited color combinations are the ultimate eye candy. Sherry Serafini and her incredible designs. This piece was my first attempt at a necklace. I am a relatively new bead enthusiast, so I'm like a kid in a candy store, I just can't get enough. This design just grew from a focal cab that I had no idea what I was going to do with. As I hunted and gathered from bead shows, and much from FMG's catalog, my color scheme came alive. Then last, I found gorgeous Teuga Nuts and I was ready to let the beads do the talking. 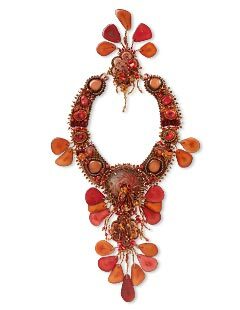 I took a basic beading class in January 2008, during which I saw a picture that spoke to me on the wall of Sherry Serafini's ''Nichol Lyn,'' an award-winning necklace. I said to the teacher, ''I want to learn how to make something like that,'' and she said, ''Honey, you're not ready for that,'' which intrigued me. Almost like the rebellious teenager I once was, I silently thought, ''Watch me!'' A few days later, not knowing who Sherry Serafini was, I flipped through a Bead and Button magazine and saw this killer bracelet and a website. When I saw her website there was that same necklace that I saw on the wall in my beading class. Now, I finally see Sherry's face, and the cherry on top is she's standing there with my all-time favorite ''God of Rock Stars,'' Steven Tyler. It was Kismet! I knew then I had to make contact and meet this girl. NO one has grabbed my attention like this, not in a long time. As a result of corresponding with Sherry, my creative side has blossomed and my beading journey began. So, I took basic peyote stitch class and a bead embroidery class and I was off and running. I made a cuff bracelet and a great belt. Next, Fire Cracker was born. No one. I was searching for something so I signed up for a beading class at my local Michael's Store. I guess the beading gods decided it was my time. Not formally. My mom signed me up for all kinds of art classes when I was a kid. I was always drawn to beads--like magic markers and crayons, it must have been all the colors. Basically, I would string beads and that was the extent of my former years beading. I feel my artistic talents come from my father's side of the family. My dad, brother, and uncles all do some form of metal work or painting in the auto body profession. So, I guess it's just in my genes. A friend of the family, who also makes jewelry, Barbra Flood, turned me on to Fire Mountain Gems and Beads. I thought I was in heaven when I received my first catalog. I have many outlets for relaxing, from motorcycle and horseback riding to meditation and yoga. Knitting, crocheting, shopping, reading--but I have found at this point in my life my passion is beading and by far the most rewarding. Well, I'm a type A personality. I bead almost every day. I have to keep my hands moving so I turn my tunes on and bead. The phone can ring off the hook cause nobody's home! Beading serves as a relaxing meditative source for me physically and emotionally--honestly though sometimes it can really test me. Overall, beading makes me let go of life's annoyances and go to my own happy place. No, not at this point. As for the future, who knows, anything is possible. Not at this point, but if it involved an animal charity, I would. If you're even thinking about it, just do it!!! What I really like is no rules, just basic technique. No right or wrong way and for me that's a fit. So, let the beads or any other medium move you. And through your art ''let your soul shine.'' And last, many thanks to my new-found beading family Jane, Diosa, Donna, Leslie, Dave and so many others and especially to Sherry for her help and encouragement wherever this beading journey takes me. Also, for pushing me to enter this contest. Kimberly's design, Fire Cracker was the Silver Medal Winner in the Turquoise and/or Coral category of the 2009 Fire Mountain Gems and Beads Beading Contest.